Tourism extended to space but this destination is still expensive and the "operator" is only the Russian Space Agency for the time being. For US 20-30 million the tourists will embark on a Soyuz spacecraft and can admire the Blue Planet from a distance. 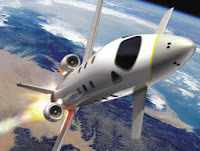 The suborbital space tourism is more affordable and is viewed as a money making activity by companies such as Space Adventures, Virgin Galactic, Blue Origin or Starchaser. The package would include a few minutes of weightlessness, a view of twinkle-free stars and a panorama of the Earth curve and all would cost around USD 200,000. Virgin Galactic intends to send tourists to space (and bring them back) for the initial seat price for $200,000 but the prices is believed to decrease to USD 20,000 eventually. So far around 200 tourists have booked their holiday into space. Next time your friens tell you they go on holiday to the Dead Sea, take it with a pinch of salt and keep an eye on their Facebook photos.